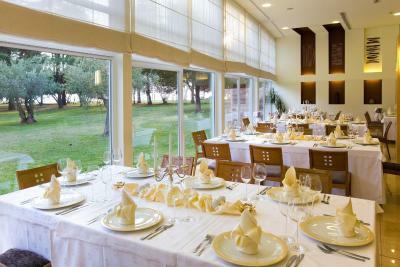 Lock in a great price for Hotel Sol Umag for Plava Laguna – rated 8.3 by recent guests! The staff is always willing to help. They are respectful and pay attention to requests. Food ok, facilities ok, jung staff was professional, elderly not so much. 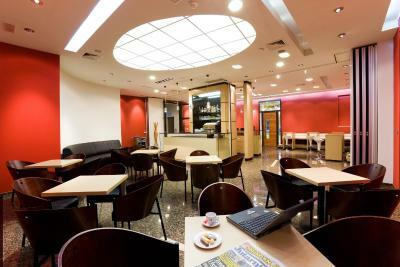 The location was perfect, staff was helpful, rooms were very nice and clean and the breakfast.... Excellent! Loved every second there! 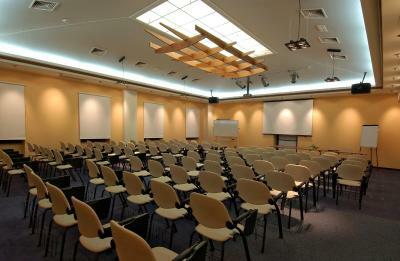 The hotel is really beautiful, brand new and well equipped. Intriguing activities in the lobby. Ivan the receptionist was really really kind, honest, informative, helpful and nice. Appreciable attitude. well done. Our room was extremely wide, clean and beautiful with a little balcony that turns to the beautiful garden, that even with horrible weather we had, it was enjoyable. Breakfast was extremely good. huge variety, was probably the biggest breakfast we had in our vacation. I really like that the last day of our stay we could still use a hotel parking place, leave luggages at the hotel and after we enjoy the last goodbye swimming at the sea we could also take a shower at the hotel's wellness! 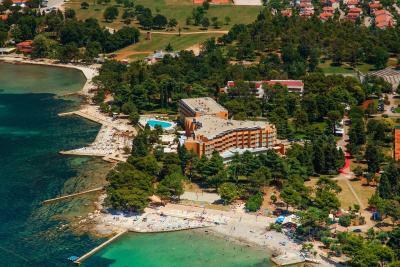 I was visiting Sea Star festival in end of may and stayed in this wonderful hotel located in a very charming city of Umag. 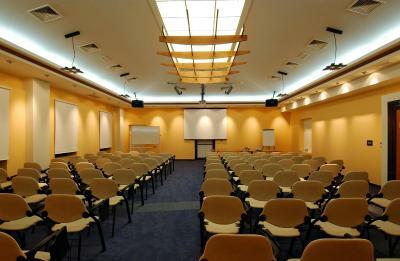 The hotel is situated well, near to the festival place and to the downtown too with direct access to the sea beach. 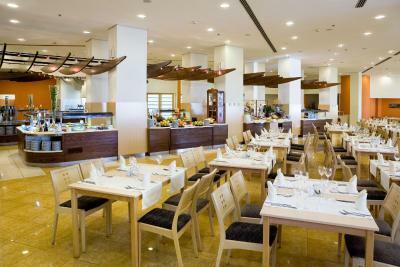 Everything was exceptional: clean rooms, delicious food for breakfast and dinner buffet with variety of many Mediterranean and traditional meals, nice wellness... The staff can be rated only with perfect 10+. Specially Mr. Giuliani with his positive energy is incredible. I also spent a wonderful time in wellness having a nice conversation with one of therapists. I would like to find out her name to recommend her if you enjoy a relaxing massage and you would like to be provided with useful information for young people staying in Umag. Thanks a lot dear warm people. 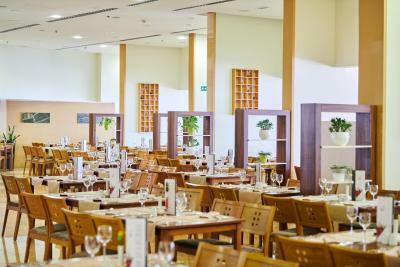 I was nice, clean, good food, professional staff, friendly reception, we could use the indoor pool at the day of departure for a whole day, good wifi for kids. Hotel Sol Umag for Plava Laguna This rating is a reflection of how the property compares to the industry standard when it comes to price, facilities and services available. It's based on a self-evaluation by the property. Use this rating to help choose your stay! 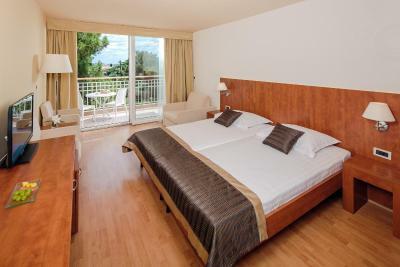 One of our top picks in Umag.Located just 0.6 mi from the town center and directly by the sea and the beach, Hotel Sol Umag offers modern and elegant air-conditioned rooms with a magnificent sea view. There is a wellness center and several restaurants. The large outdoor pool has a children’s section, a rich daytime program of activities and numerous evening events. At the wellness center, with indoor pool, 3 types of sauna, whirlpool and relaxation room, guests can book a number of beauty and massage treatments. 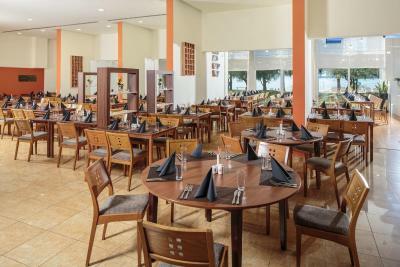 There is a buffet restaurant with show cooking, the à la carte Léon d’Or Restaurant and a pool bar serving a number of snacks and local specialties. 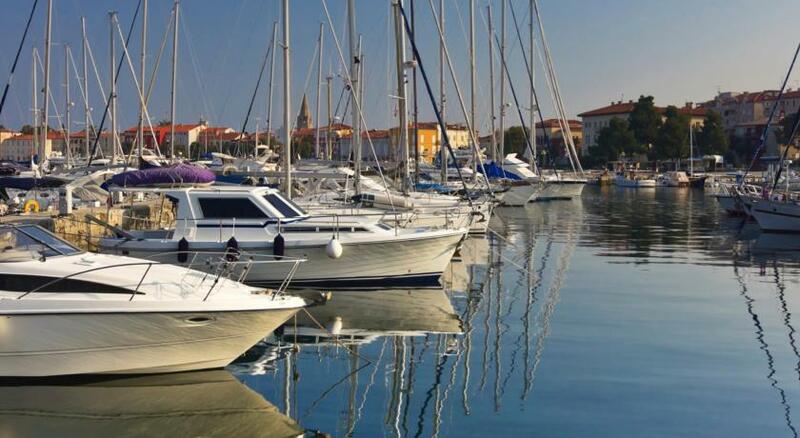 In addition to private parking, Hotel Sol Umag also offers possibility to reserve an exclusive parking place right in front of the hotel at a surcharge. 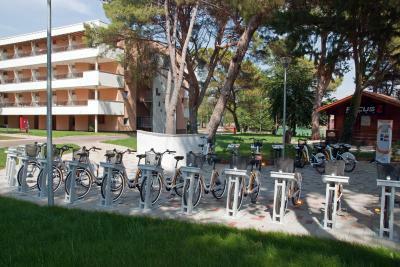 An integral part of the Sol Umag Hotel is also the Bike Point with professional support for road cyclists, mountain bikers, cycling tourists and amateurs. 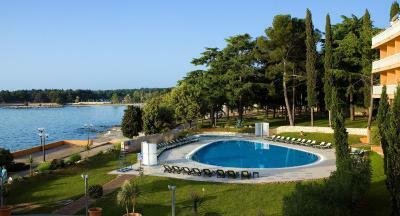 When would you like to stay at Hotel Sol Umag for Plava Laguna? 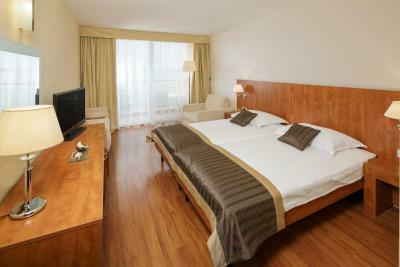 Spacious double room with satellite TV and a bathroom with a tub. 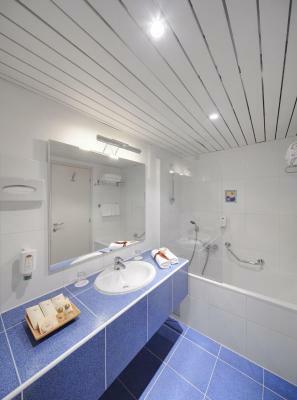 Spacious single room with satellite TV and a bathroom with a tub. Spacious double room with a balcony. The room has satellite TV and a bathroom with a tub. 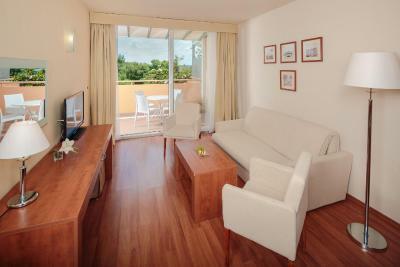 Spacious and modernly decorated double room with frontal views of the Mediterranean Sea. The room features a sofa bed, satellite TV and a bathroom with a tub. 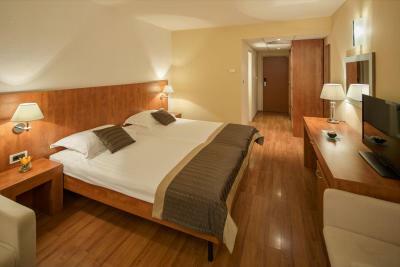 Double room with satellite TV and a bathroom with a tub. Please note that no extra beds are possible in this room type. 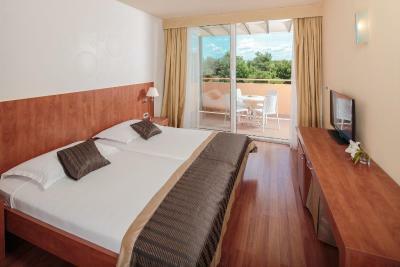 Very spacious junior suite with a furnished balcony and a view. 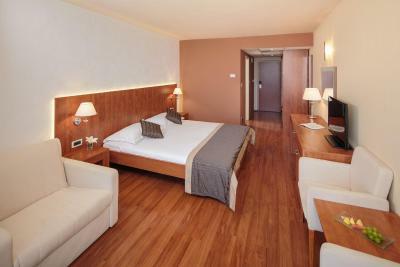 The junior suite has a separate lounge area and a bathroom with bathtub and free toiletries. 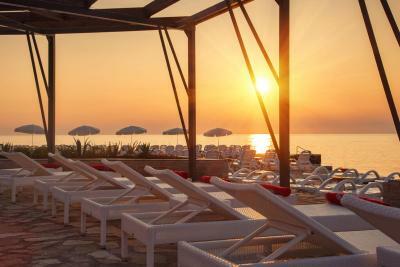 Sol Umag Hotel is only a step away from the Adriatic Sea. 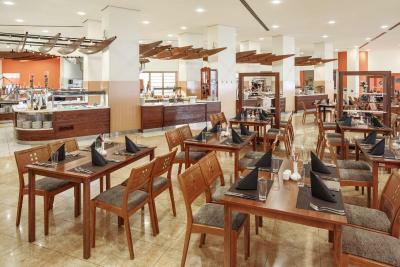 Functionality was the guiding principle behind the recent renovation of its interior, and the hotel has always been known for its varied and quality service. 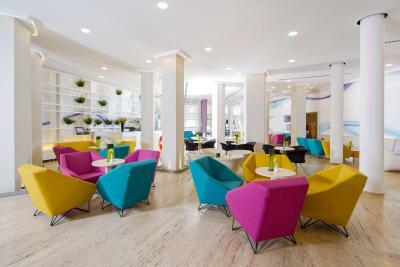 Modern design and comfort of hotel rooms, 86 rooms in a separate facility (Residence),reception desk and the hotel lobby are one reason more to choose this hotel. 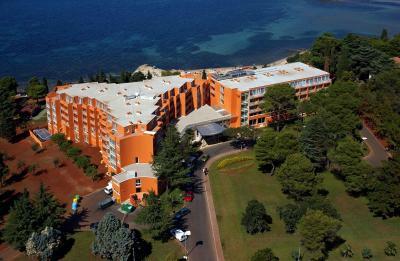 Apart from the interesting interior design, the hotel also offers an attractive beach with several canopied relax zones. Beside premium wellness and congress amenities, all lovers of cycling will be pleased to find a bike point.Come a step away from the Adriatic, a step toward a perfect holiday! 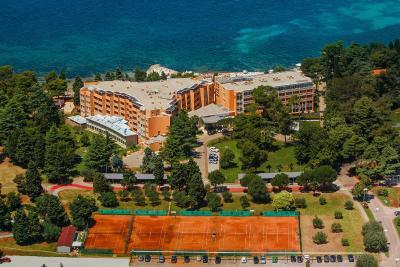 Discover the superior service offered by this elegant Umag hotel once again! 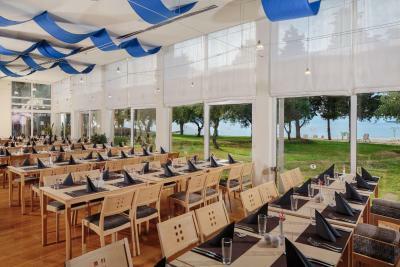 Sol Umag Hotel introduced a novelty for all guests living by Halal values and nurturing a healthier lifestyle by becoming the first hotel in Istria with certificate of Halal quality (package label A). 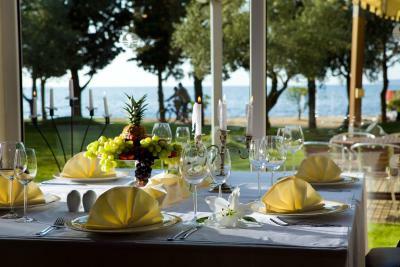 House Rules Hotel Sol Umag for Plava Laguna takes special requests – add in the next step! Hotel Sol Umag for Plava Laguna accepts these cards and reserves the right to temporarily hold an amount prior to arrival. Nothing special. Perhaps the bathroom could be more modernly equipped. In any case, I'd rather have a shower in the room than a regular tub. Restaurant (main courses) were below not 3 but 4 star level. Like in school menza. The perfect view of sea. The food was mediocre, the steam sauna was so hot that me and my boyfriend could not be able to stay inside for more than one minute. The Istrian bio sauna was great though. I liked the sea view, very welcoming staff. One thing which did affect slightly was that our room overlooked the terrace and was over the bar so we could hear music playing till late and people outside talking. No major issues. The staff were extremely helpful. There was an enormous choice at breakfast. The rooms were comfortable and bright. Inside pool and spa was a bit crowded. 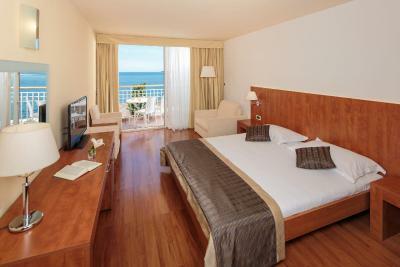 Good location, next to the beach, great seaview from superior room. Excellent WiFi connection (room, pool, restaurant). Very kind hotel staff. I knew that this is not a new hotel so I lowered my expectations but some things could be better even here. For example the staff could be a litlle kinder, maybe have a smile sometimes (this goes to the wellnes people not reception). Also a lot of bulbs were broken, most of the clocks on the wall do not work, half of the gym is out of order. The pool could be cleander. Activities for the children are advertised but thera are none. It was ok. People on the reception nice and proffesional. Cleaning lady busted in several times without knocking. Average food. Clean. Average 3 star hotel. Not 4 star. 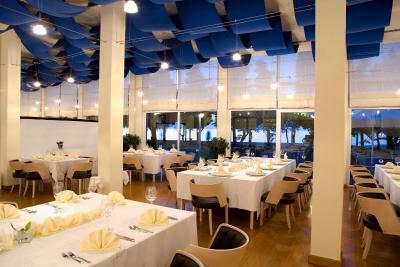 Excellent food, nice big rooms with beautiful view on the sea, very nice and helpful staff. 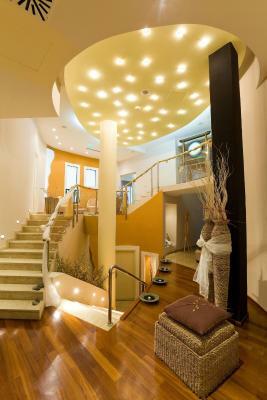 I very much liked the spa with saunas - not very big, but cute. 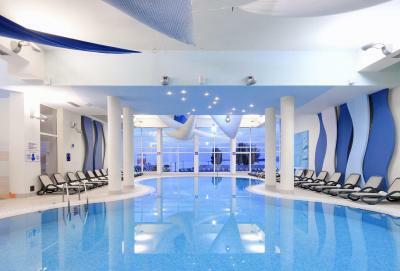 It is great that both - inner and outer pool work in October (since it was 24 degrees). Location by the sea is great. Quite disappointed by the dinner - many choices but the food was cold.